The V-Moda Forza earbuds are ones you can dress down for the gym or dress up for your train ride home. They feature an ingenious modular design, durable build and fun sound, but audiophiles will have to look elsewhere. Building a headphone is a balancing act. It’s not easy creating a pair of headphones that look great, sound good and are built well. Usually, manufacturers get two out of the three right, but leave one aspect with something to be desired. V-Moda has had a streak of successes with popular headphones like the Crossfade Wireless and M-100. With their eye-catching design, balanced sound and great build quality, it’s easy to see why V-Moda headphones are so popular among audiophiles. The company’s latest headphone, the V-Moda Forza, look to continue the company’s success streak by offering a reasonably priced pair of wired earbuds, but with a trick up its sleeve. 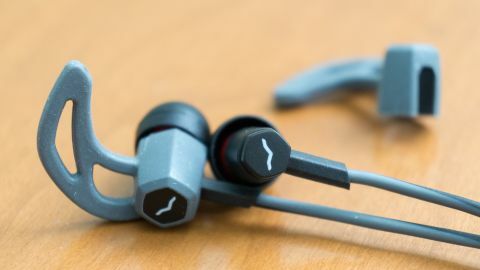 While the Forza may look like your standard earbud, they’re actually modular so you can dress them up or down for when you’re at the gym or when you’re on your train ride home. You’ll either love or hate the aggressive styling of the Forza. Like V-Moda’s past headphones, the Forza feature an angular design. From its hexagonal earbuds to its 45-degree angle headphone jack, there aren’t many rounded surfaces to be found. Although its design is aggressive, the Forza is also somewhat understated. The earbuds feature a black and dark gray color palette that make the headphones look like a stealth fighter jet. Nothing really stands out about the headphones until you look at the accessories that come in the box. The most interesting design element of the Forza earbuds is that they’re modular. In addition to optional 3D-printed ear caps that slip over the earbuds for some added flair (available for an additional cost when purchased with the headphones), the headphones let you add wingtips or ear hooks to help you keep the buds in your ears during your workout. Speaking of workouts, the Forza earbuds are sweat and weather resistant so you won’t have to worry about getting them wet. However, they’re not waterproof so don’t submerge them in water. The gray wingtips slide over the earbuds and snap into place. They’re super soft and I found Forza to be one of the most comfortable earbuds I’ve ever worn – thanks to its lightweight design, the buds never worked their way out of my ears. Its lightweight cable is also tangle resistant, so you can jam them into your bag without worrying about making a cable monster. Speaking of the cable, the V-Moda Forza produce a lot of cable noise when worn normally. However, using the included ear hooks or simply wearing them over the ear cuts down cable noise significantly. V-Moda also includes a shirt clip to fight cable noise if you want to use it. Attached to the right earbud is a three-button inline remote that’s designed for Android phones. You can control playback and volume with the remote, but note it will only work properly with Android phones. iPhone users can still use the Forza to listen to music, but the remote will not function properly since Apple opted for a different pin setup. Included in the box are tons of eartips, wings, a pair of ear hooks, a shirt clip and a carrying pouch. I would have loved to see a hard case but the Forza feel so well built that it may not be necessary. V-Moda has a history of making good sounding audio gear and the Forza are no different. They feature a fun, slightly bass-heavy sound that works perfectly with pop and electronic music. Bass digs deep and provides a satisfying rumble. Audiophiles will have to look elsewhere, though, as the Forza earbuds are tuned more for fun than for analytical listening. For example, the much more expensive Beyerdynamic iDX 200 iE provide better detail and instrument separation. The lack of detail is apparent when listening to acoustic guitar or violin as the Forza can’t recreate the texture of the instruments as you would be able to hear in real life. However, most listeners won’t notice this drawback unless they’ve had experience with more expensive headphones. For $100 (around £80, AU$130, however, UK and AU pricing pending), there’s very little to complain about the Forza’s sound. The added warmth may mask some high frequencies, but this tuning helps poorly recorded music and compressed audio sound good. These are perfect headphones for working out or listening on your commute where you don’t need the last word in audio fidelity. We were pleasantly surprised at how the Forza managed to sound expansive with music sounding like it’s around you rather in your head. This is difficult to tune with in-ear headphones and V-Moda did an excellent job in this regard. One thing to note about the V-Moda Forza is that they are less sensitive than most other earbuds. This means you’ll have to turn up the volume a bit more than you’d be used to with more sensitive headphones. It’s by no means a deal breaker but something to be aware of. V-Moda has done an excellent job making the Forza earbuds a compelling package for just about everyone. Its styling isn’t too aggressive but still manages to stand out from the crowd of generic looking earbuds. Its modular design is brilliant as it lets you add wingtips for the gym with the option to remove them on the go. The V-Moda Forza’s sound is good for the price but its warmth may leave some listeners wishing for a more balanced presentation. While the modular design is creative, it also makes it easier to lose parts for the headphone. As a package, it's hard to fault the V-Moda Forza. They sound good, are built to last and its modular design is like nothing I’ve seen before on an earbud. The Forza are perfect for anyone who wants a headphone that can do it all, from working out to using at work. Sure, it’s not the most balanced sounding or highest resolution, although its Hi-Res Audio branding would lead you to believe so. Competitors sound better, but lack the water resistance and modular design of the Forza make it an extremely compelling choice.